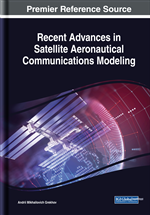 This chapter considers simulation of traffic in the transmission of ADS-B messages with the help of low-orbit satellite complex Іrіdіum. Different models of communication channel “Aircraft-Satellites-Ground Stations” were built using NetCracker Professional 4.1 software. Influence of aircraft and satellites amount on average link utilization and message travel time was studied for telecommunication channels with intersatellite link and bent-pipe architecture. The effect of communication channel “saturation” during simultaneous data transmission through a satellite communication channel from many aircraft was investigated. Influence of protocol type, size of transactions, time between transactions, and channel latency on traffic was studied. A method for estimation of traffic losses was proposed and dependencies of the data loss coefficient on the size of transactions were received. New times have come for aviation communications. Soon it will be basically a data exchange, and voice communication will be used in non-standard and emergency situations. The main emphasis in the development of aeronautical communications is now being made on functioning on a global scale. Globalization makes it possible to use channels more efficiently and provides sharing of opportunities by many users. Non-safety-related modes of communication: aeronautical administrative communication, carried out by aviation personnel and/or aviation organizations for administrative and private matters; aviation communication for passengers. In addition, for the transmission of surveillance data and data that provide better knowledge of the air situation, direct communication and communication in the broadcasting mode are used.